Community Giving Project - May 2017 Bonus! Everyone at San Diego Self Storage is proud to embark on the third year of our Community Giving Project, carrying on a tradition of giving back to San Diego. We love this project! San Diego Self Storage facilities span San Diego County from Temecula to Otay Mesa. We wanted to find a way for all 17 of our locations to develop meaningful ties to their local communities. We’ve given each site $500, which they may contribute to any organization they see fit. We’ve contributed to a variety of philanthropies, with charities benefiting children and animals at the top of the list. Our teams have also chosen to help fight cancer, contribute to local history and humanitarian efforts. The photos above show the variety of organizations which have benefited from the program. Below is an update on our most recent contributions. Life & Strength is an international, non-profit organization and has been helping people living in vulnerable places since 2013. Life & Strength’s goal is to promote solidarity and support between people to contribute to the development and welfare of all humans, particularly those most in need both materially and spiritually. They have extended their hands to help communities in need on both sides of the US-Mexican border. Life & Strength serves many aspects of the local community. For example, they contribute to children’s education and help them acquire uniforms, materials and other tools to succeed. Life & Strength also creates youth support programs to provide youth with guidance, keeping them away from negative influences. The organization's volunteers take pride in assisting seniors in low-income senior homes. The team at Otay Mesa Self Storage wanted to bring attention to this local, charitable organization, which has already made a positive impact on the community in just its few years of existence. 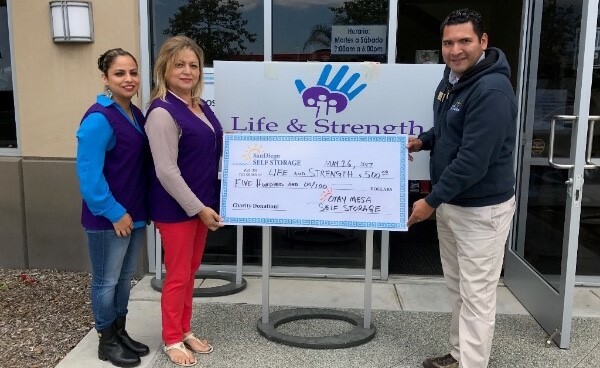 Tanya Lee, Assistant Manager, and Delia Lam, Manager from Life and Strength and Otay Mesa Self Storage Manager, Zabdiel Zavaleta pose for the picture (above) with the donation.